It's not uncommon for a washer to malfunction and no longer complete one of its cycles. 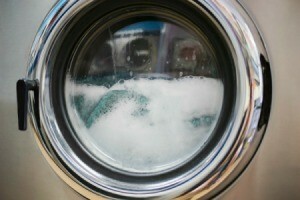 This page offers advice about what to do when a Kenmore washer stops after its wash cycle. My washing machine is not completing a cycle. It is a Kenmore top load washer. My washing machine will fill and agitate, but when it is supposed to drain and rinse, it just stops. It does not drain or anything. If I turn the timer to another setting (i.e. rinse, spin) nothing happens. If I turn it back to fill, it just agitates because it is still full of water. What could it be? Maybe the timer or the pump? This happened to me. This is what the repairman told me. There is a little plastic point sticking out on the underside of the lid. When you shut the lid it goes into a hole on the washer. The piece the point goes into broke. They used to be made of metal, now made of plastic. Lid could have fallen down and broken it or just from wear and tear. Hope this helps. Check your lid shut off switch. Check your connections. My Maytag was doing this, but dumping and skipping cycles. I ordered a new timer (online was about 50% less) and in 10 minutes installed it. A simple older Kenmore does not have too many things to go wrong. Neither does a dryer, until you buy electronically controlled. Then the repairs go from OUR hands to someone else's for $. You have the wigwag in a Kenmore that Maytag does not have. Up till this washer, I had Kenmores for decades! Always took parts off one when junking it to keep for the next one. Neighbors did the same, we would trade for what we needed. Universal parts! Sears will come out and fix that! I had a use Kenmore washer and it did that to me, and I called Sears and they fixed it. I no longer have the washer, but it lasted me 5 years considering it was used, I only payed $100.00 for it. Short answer: Its the water hose! Long answer: My Kenmore also kept stopping during the wash cycle after only running for a month with no problem. Out of nowhere it just started to stop during the wash cycle. The troubleshooting manual said it could be the water pressure and to check the hose. I looked at the hose and it looked fine. So for the heck of it I straighten out the hose with zip ties so it feed in the machine straight.Believe it or not it started working correctly again. Why did it take a month for you might ask? I think gravity made the curl of the hose just enough of a slight bend and made it harder for the water to enter at the wash cycle sensing sequence. What a pain this machine has been.